Having successfully executed over 350 Data Integration projects using various leading Integration tools, Tiara has the expertise and hands-on experience to develop an integration tool. 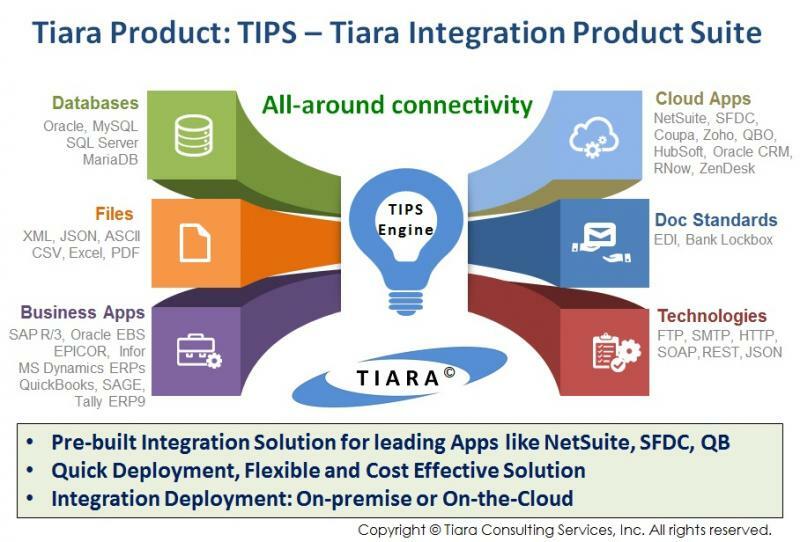 Tiara Integration Product Suite (TIPS), a data integration product fully developed and owned by Tiara, helps businesses accomplish all their Integration needs at an unbeatable cost. 1. On-Premise: TIPS is deployed as an on-premise solution if one of the applications being integrated is either a Desktop or Client/Server software with no access outside the network. 2. On-The-Cloud: TIPS is also available as a Cloud based Platform / Solution and it is opt for integrating data across Cloud based applications like NetSuite, Zoho, Salesforce.com, QB Online etc. Tiara offers pre-defined data integration solutions for popular applications. TIPS On The Cloud can be accessed at www.tiaraintegration.com. While building standalone applications may be the "quick" solution to an immediate business problem, maintaining the resulting redundant and inconsistent databases and applications is a huge cost to organizations. TIPS is a cost effective on-premise / on-cloud integration solution that can be easily implemented to meet the dynamic business needs of organizations. TIPS enables organizations to seamlessly Integrate data between various enterprise applications thereby enabling organizations with single version of true data, a fewer interfaces and the ability to provide more timely data. Using TIPS one can integrate data to/from Flat files, Databases, On-premise applications (SAP R3, MS Dynamics GP / AX / NAV, Oracle EBS, EPICOR, Infor, QuickBooks, SAGE, TALLY ERP9) and On-demand (Cloud / SaaS) applications (NetSuite, Salesforce, Oracle CRMOD, Oracle RightNow, Hubsoft, Zoho, QBO). It also supports standard technologies such as FTP, SFTP, FTPS, SMTP, HTTP, SOAP, REST for transmitting / exchanging data across different systems. © 2019 Tiara Consulting Services, Inc.